My colleagues and I at Rocky Mountain Wild first had the pleasure of meeting John Davis as he came out of the woods near Shrine Pass Road at the top of Vail Pass in Colorado. This was a fitting entrance for John into our world as he immediately came face-to-face with the behemoth that is Interstate 70, traversing Vail Pass as it transects the state. Standing at the top of Vail Pass, it seemed likely to us that wildlife on the move through the area must be acutely aware of the presence of the Interstate – not only from its impact directly on the landscape as it bisects undeveloped habitat on national forest lands on both sides of the highway, but also from the auditory impacts from the 18,000 cars and trucks using the roadway in the area every day. Some wildlife are probably so affected that they won’t even attempt to approach the highway. 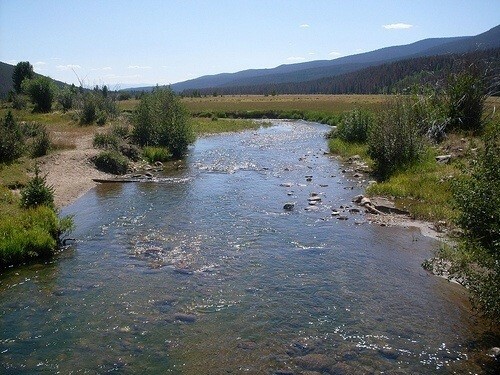 Thus the reason we brought John there – to emphasize the urgent need to reconnect essential wildlife corridors such as Vail Pass throughout the state. 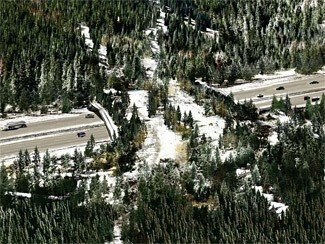 For Rocky Mountain Wild and our partners, the vision of a reconnected Southern Rocky Mountains starts with the I-70 Wild Byway, a public private partnership promoting the construction of Colorado’s first wildlife overpass over I-70 at Vail Pass. It is our hope that this overpass will be just the first of many structures built both over and under the highway improving connectivity for wildlife throughout Interstate 70’s 144 mile mountain corridor. We were joined at the top of Vail Pass by our good friend Will Roush from the Wilderness Workshop as well as colleagues from the Forest Service and Colorado Parks and Wildlife. Each group has been instrumental in laying the groundwork for the I-70 Wild Byway. Each group also had their own story to tell about other important works in progress to reconnect the landscape, such as Wilderness Workshop’s efforts to ensure conservation designation that will safeguard connectivity in the Vail Pass region and throughout Colorado. After our meet up on Vail Pass, a successful event at Denver Zoo with over 90 attendees, and an exciting interview on Colorado Matters, John made his way through the rest of northern Colorado before being handed off to our partners at Biodiversity Conservation Alliance in Wyoming. Biking from Boulder to Rocky Mountain National Park, he rode through a Wildlife Crossing Zone, created after legislation sponsored by Rocky Mountain Wild and partners was passed in 2010 to either lower nighttime speed limits or double fines from speeding on Colorado’s roadways that are deadliest for wildlife. Within Rocky Mountain National Park, John explored one of Colorado’s largest protected areas and traversed alongside the headwaters to America’s most endangered waterway, the Colorado River. TrekWest is a brilliant campaign working to assess the state of our western wildways and bolster the efforts currently underway to protect and restore connectivity along the Spine of the Continent from Mexico to Canada. Though I unfortunately did not get to hit the trail with John, I will remain inspired by the conversations we had while navigating our human migration routes for years to come. It was a true pleasure to be involved. Your kind consideration of a DONATION– all to help TrekWest inspire as many people as possible to support wildlife corridors and to keep up with basic supplies and equipment — is much appreciated.